As market researches have shown that the price gap have been narrowing between prime residential properties and those in the mass-market, city fringe homes are looking more favorable to property buyers these days. According the recent numbers, the median price of city fringe homes is approximately S$1.2 million, whereas for those in the high-end market, the median price was S$2.2 million. You can see why we should be paying attention to city fringe properties. City fringe properties are often referred to properties located in the Rest of Central Region (RCR). During the past 1 year, a total of 223 caveats lodged from new launch sales for units sized between 701 to 900 sqft that were transacted between a price range of S$971,000 to $1.32 million. The residential condominium which topped the list was Eight Riversuites, with 59 units transacted in total, with price starting from about S$1 million. Next up, we have City Gate at Beach Road (former Keypoint building) and Commonwealth Towers (located next to Queenstown MRT Station) with number of caveats lodged at 32 and 28 respectively. Also in the list are the likes of Bartley Ridge (next to Bartley MRT Station), Highline Residences at Kim Tian Road, The Venue Residences (next to Potong Pasir MRT Station) and Sims Urban Oasis. 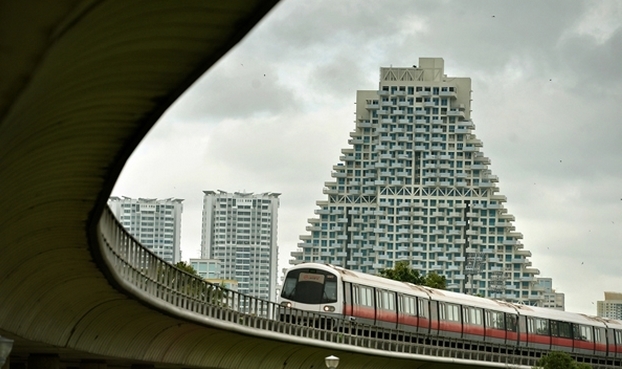 Apparently all these city fringe condos are within a short walking distance to a MRT Station. Also, it’s not difficult to understand that the biggest draw to property buyers remains to be their centralised location. Other than Geylang, or even Balestier, was any city fringe property transacted for less than S$971,000? Yes. Within a short walk to Potong Pasir MRT Station, we saw 5 transactions from Riverbay (a 999-year leasehold condo) and 3 transactions from The Venue Residences. As for homes with size between 901 sqft to 1,100 sqft, the 99-year leasehold homes in the mass market segment were transacted from a range between S$1.25 million and S$1.57 million. For a similar price range, we saw 127 caveats lodged from new launch condo sales in the city fringe property segment. Out of these 127 caveats, 37 of them came from Eight Riversuites (starting from S$1.26 million) and another 36 from Thomson Three at Bright Hill Drive (starting from $1.3 million). Also, another 13 transcations were contributed by Alex Residences situated next to Redhill MRT Station (starting from S$1.43 million). Affordability has always been the key factor when buying a property in Singapore for most buyers today, ever since the Total Debt Servicing Ratio took effect in June 2013. So the question is, are homes in the city fringe area under-priced, or the ones in the mass-market area are overpriced? In fact, the right question to ask is which property segment gives more value to the property buyers. If we simply look at average rental yield between both segments, they both posted the same rental yield percentage of 3.2% which was based in 1Q2015. Since 2011, the price gap between non-landed residential properties in the city fringe segment and mass market segment have narrowed from as much as 35% to about 29% by the end of 2014. As of 1st quarter of 2015, the median price for city fringe new launch sales was S$1,432 psf and mass market clocked in about S$1,188 psf. That’s approximately 21% more in the city fringe property segment, therefore if you look at the median prices, mass market properties are certainly more affordable. However, if a property buyer is paying top dollar for a mass market property, which is the top 25% of prices in the segment, they might be able to get themselves a decent and valuable property in the city fringe segment instead.